To make a phosphorescent preparation, simply break off the point of an indelible lead pencil and pulverize it thoroughly with a pinch of powdered boric acid (boracic acid), which you may find awaiting use as an eye lotion in the family medicine chest. Heat the mixture in a tin-can lid with the aid of a Bunsen burner, an alcohol lamp, or the kitchen range. The pulverized mass will twist and squirm, finally becoming shiny and glasslike. When the lid and its contents have cooled, hold the product close to an electric light. Then turn off the light, and if the room is dark you will see the preparation glow vividly. Its light will gradually dim and disappear. You can obtain phosphorescent light of different colors by heating boric acid powder with household dyes, or with a bit of fluorescein, and varying the heating so that the boric acid is only partly fused. For black-light experiments with fluorescent chemicals, you will need a source of ultra-violet rays. The handiest is an argon lamp bulb, which you can obtain from any large electrical store for about half a dollar. Screwed into any lamp socket providing the ordinary house current of 110 volts, it emits a quantity of invisible ultra-violet light, besides some visible violet light. The lamp bulb may be fitted with a cup-shaped shade, to concentrate its rays upon your chemical bench, and to screen the visible light from your eyes so that it will not interfere with your observations. Many other sources of ultra-violet light are available for your experiments. Even direct sunlight will enable you to observe the fluorescence of a few chemicals, though in most cases the brightness of the visible part of the sunshine masks their fluorescent glow. 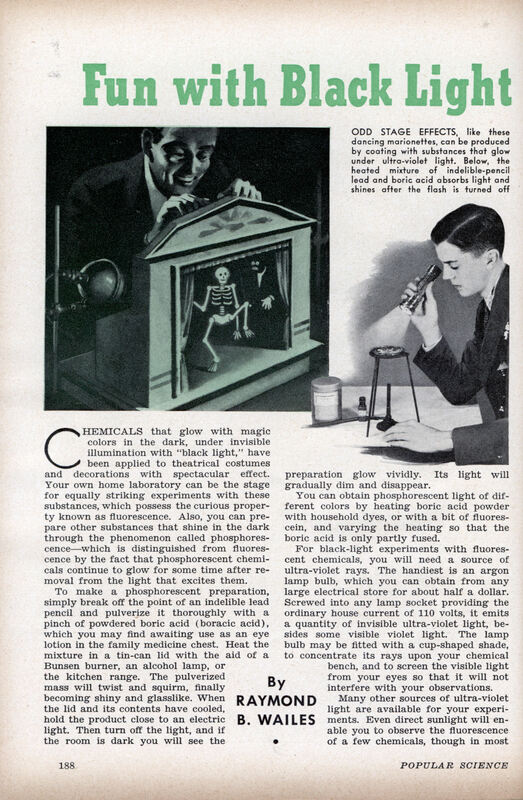 A photo-flood lamp will provide you with black light if you inclose it in a well-ventilated box, lined with asbestos paper, and let light emerge only through a window of special ultraviolet filter glass. This purple-black glass, opaque to practically all but ultraviolet rays, may be obtained from dealers in scientific apparatus and chemicals. 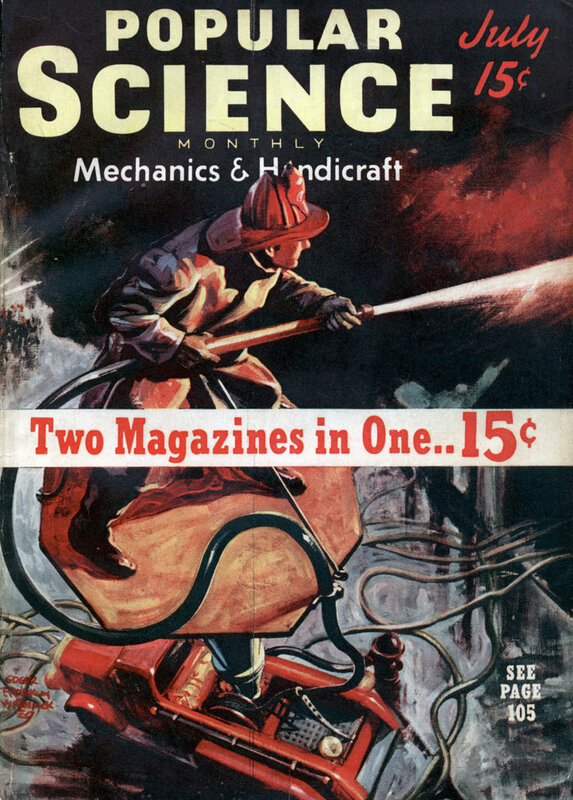 If your home laboratory does not have 110-volt current on tap, you can produce ultra-violet light of sufficient intensity for many experiments with an iron spark gap, connected to a battery-operated spark coil. To start your black-light experiments, you need look no farther than your own household for fluorescent materials. Ordinary machine oil, exposed in a darkened room to your source of ultra-violet rays, will glow with blue light. So will petroleum jelly from the medicine cabinet. Calomel, or mercurous chloride, in solid form, will fluoresce under like conditions with a peculiar orange-gold color. Pyrogallic acid, familiar as a photographic developer, also exhibits fluorescence upon exposure to black light. However, more spectacular tricks of chemical magic can be performed with anthracene, a coal-tar product that will glow vividly with a yellowish-green color in ultra-violet light. Dissolved in benzine (benzol), gasoline, or xylene, it makes an invisible ink with which you can write secret messages on paper. When the writing dries, it cannot be seen in ordinary light. Hold it before ultra-violet rays in a dark room, however, and it will glow in letters like fire. HERE is an entertaining variation of the stunt, to perform before your friends. Darken a room in which you have set up a white sheet of cardboard as a “blackboard.” Dip a stick of chalk momentarily in a xylene or benzene solution of anthracene, and let the chalk dry. Then write with the prepared chalk upon the white “blackboard,” which must be illuminated meanwhile by black light. The message will be traced in fiery, glowing letters, with mystifying effect that you can enhance by clever showmanship. Small dolls, whose clothing has been dipped in anthracene solution and dried, will also fit well into any program of chemical magic. They glow weirdly when you make them dance under black light. For a two-color effect, impregnate only part of the clothing with the anthracene solution, and the rest with a solution of sodium salicylate in water. When dry, the latter fluoresces under black light with a pale-blue color. Even in daylight, a solution of fluorescein in water will visibly fluoresce. A mere speck of the chemical, no larger than a pinhead, will suffice to make a quart of solution. To help dissolve the fluorescein, add a gram or quarter teaspoonful of sodium hydroxide (lye) to the water. The fluorescence of the solution becomes far more vivid under black light. Use the liquid to fill a round-bottomed flask, or a burned-out electric light bulb with the base removed, and you will have a “crystal-gazing globe” that will magically glow in the dark when illuminated by ultra-violet rays. To make another preparation whose fluorescence can be seen in sunlight, add a solution of ammonium fluoride to a solution of uranium nitrate until no more precipitate forms. Filter off the precipitate, which is a uranium compound called uranyl ammonium fluoride. Wash it with alcohol while it is still on the filter paper, let it dry, and then promptly stopper it in a bottle. This solid substance, like the fluorescein solution, fluoresces much more brilliantly in the dark, under an argon lamp. Increasing the power of your black-light source enhances the luminous response of fluorescent substances, and you can do this by mounting several argon lamps close together on a board. Wire them in parallel, or so that each receives its supply of current independently of the rest. As the argon bulbs consume only two watts apiece, a dozen or two of them would use no more current than a standard twenty-five or fifty-watt bulb. black light to the specimens in the box, you can view them through a hole cut in the top. Any leakage of visible light into the box may be prevented by surrounding the peep hole with a masklike shield that fits your nose and forehead. Such a viewing box will enable you to observe the fluorescence of many more substances. Common buttons glow with a blue color, which cannot be seen by the unscreened argon lamp because its own visible light masks the faint blue fluorescence. Uranium-tinted glassware, yellow-green in color and found in many households, will also fluoresce in the viewing box. DYES in particular are apt to exhibit fluorescent properties under the rays. An alcoholic solution of rhodamine will glow red. A solution of uranin in water will shine with yellow light. Many minerals, too, show fluorescence. Some substancesâ€”including the preparation of boric acid and a dye, described in an earlier paragraphâ€”are both fluorescent and phosphorescent. Camera fans know that light rich in ultraviolet rays will act much more strongly than visible light alone upon a photographic film. You can easily make a light-sensitive solution that will respond to different kinds of light in similar fashion. Dissolve about five grams, or a teaspoonful, of ammonium oxalate in 100 cubic centimeters (about three and a half fluid ounces) of water. Make another solution of five grams, or a half teaspoonful, of mercuric chloride in the same amount of water. Mix the two solutions and filter. Place equal amounts of the filtered mixture of liquids in each of three test tubes. Expose one tube overnight to light from an argon bulb, and another tube, for the same length of time, to the light of an ordinary electric-lamp bulb. A screen may be placed between the bulbs so that each tube is illuminated by only one type of light. Meanwhile keep the third tube in a dark place to serve as a “blank” or reference standard. After twelve or more hours, you will find a considerable deposit of white crystals in the tube exposed to the argon lamp. The test tube lighted by an ordinary bulb will contain only a third or fourth of this amount, and none at all will be found in the tube kept in the dark. Ultra-violet rays, most abundant in the first case, promoted a reaction between the ammonium oxalate and mercuric chloride to produce the white precipitate, which consists of mercurous chloride. Sunburn is another sort of chemical action produced by black light. “Sun-tan ointments,” popular at this time of year, prevent sunburn by shielding the skin from an overdose of the ultra-violet rays in sunlight. To show how they filter out the rays, heat about five cubic centimeters (a teaspoonful and a half) of liquid paraffin oil or petroleum jelly. Dissolve two or three salol (phenol salicylate) tablets in the hot oil or jelly. Mix the product with about ten grams of lanolin to form an ointment. Now smear a bit of this preparation on a plate of glass, just as you would apply such a cream to the skin. Hold the coated plate between an argon lamp and some fluorescing substance. The fluorescence will stop, showing that the ultra-violet rays have been absorbed. A much better “sun-tan” cream for practical use can also be made easily in your home laboratory. Melt twelve and a half grams (two and a half teaspoonfuls) of lanolin and thirty-seven and a half grams (seven and a half teaspoonfuls) of petroleum jelly in an evaporating dish. Add 100 cubic centimeters or about three and a half fluid ounces of rose water, a little at a time, stirring meanwhile. Then stir in fifteen grams (about three teaspoonfuls) of calamine powder, which is a zinc compound. A drug store can supply you with these ingredients. This substance is very toxic tho but not a radiation hazard (so I’ve read). which are available at Radio Shack and elsewhere. Half of the stuff mentioned in this article will kill you if misused. It will kill you a lot and none of them will be happy deaths.